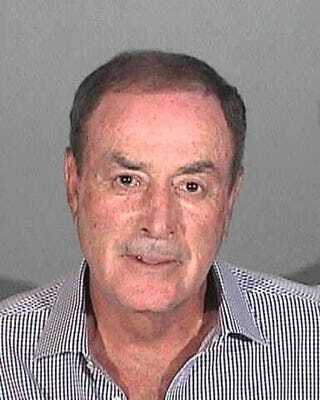 This is Al on Friday night, shortly after being arrested and charged with DUI. Is that a coy smile we see? An I'm Al Michaels, and I could do this 10 times before I lose my job smile? I think it might be. Via the Smoking Gun comes the mug shot, and another detail about Friday's arrest, in which Michaels blew juuust over the legal limit on a breathalyzer. It seems Michaels caught the attention of a Santa Monica DUI checkpoint by making an illegal U-turn—presumably to avoid the DUI checkpoint. It's a Catch-.08.